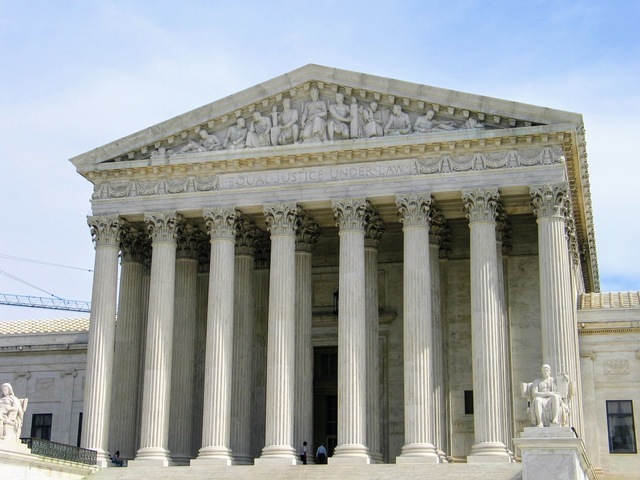 Home » Blogs » brad's blog » Could we enforce an unbiased court? In statistics, we have ways to test if things are independent events. We can measure their correlation. We could, if we wished, make rules forbidding too much correlation between judges. If a group of judges are regularly voting together, they are not being independent jurists, and this can be curtailed. This rule would mean that once the judges had voted judge A,B,C,D on one side and judge E,F,G,H,I on the other side, they could not rule in that pattern again for some period of time. If there is a group of 5 on one side and a group of 4 on the other, they could issue one 5-4 ruling, but they would have to pick it well, because they could not do that again. If they met after a case and found they wanted to repeat a ruling, somebody would have to change, possibly by switching to abstention, or even changing sides. In the event of a deadlock on changing (which is probable mostly on 5-4 splits) another formula, ranging from something based on past history to a simple random choice, would break the deadlock. A 6-3 majority would get its biased way much more often -- 48 times in fact -- so the rule could be tuned to limit that in a different way. Since judges change, the rule has to account for that. At it simplest, each replacement would wipe out the old history and start a new one. Alternately, the replacement could be considered a continuation of the record of the prior judge. That works in the more common replacement with a judge of similar leanings. In a complete flip, it would mostly reset the history. The history could also "age" so that patterns from the past get lower or even zero weight, and patterns across a judge replacement age-out even faster. Will this cause bad rulings? Some correlations will be just coincidence, or what we might view as less harmful biases. As such, this system might force rulings to change even when there is not a bias problem. I hope that could be tuned to minimize such things, but I feel that the elimination of the large biases is probably worth some cost. As I have noted, the very simple rule would not be the real rule, and something with more statistical sophistication would be used. A simple rule has the advantage that the public can understand it. But the rule does not have to be simple. Even if a complex statistical algorithm that is best done on a computer is used, we all have computers, and we all have an intuitive feel when there is too much correlation. Statisticians have all sorts of great models on how to measure correlation and quantify it. If the computer tells the court that a ruling pattern is too close to past rulings, they can act from that without calculating it themselves. The computer can also offer variations of the desired ruling which are valid for their deliberations on how to change. Well, to make it a hard and fast rule would require a constitutional amendment, probably. That's unlikely, but the one hope is that since the rule would be completely objective and mathematical, it will not be partisan. The party that currently holds "power" on the court might fight a rule that eliminates the idea of power, but if they are smart, they might realize it's better to take the power from everybody since down the road the power will shift. There have been some suggestions of non-amendment ways to change the court. The constitution says very little about the court, other than judges are on it as long as they have "good behaviour." It doesn't say how many there are, or how it makes decisions. It's not impossible congress could declare that decisions have to be 6-3. It's more likely though, that people would view this (or any formula above) as a violation of traditional separation of powers. It's been proposed that term limits could be imposed by the senate or President demanding of any nominee that they pledge to resign after 20 years. Don't pledge, and don't get on the court. The problem, of course, is that when the Senate and President are aligned politically, they want to put their judge on the bench for as long as they can. In an adversarial situation (which tends to produce far less partisan judges) they could demand the term pledge, and perhaps make it much harder for the next judge to not be asked. I am not kidding, by the way, when I say that the term problem has to be solved because I expect medicine, some time this century, to solve the problem of aging. Quite possibly within the lifetimes of Gorsuch or Kavenaugh. If so, these men have received quasi-forever appointments to the court, which is not what is desired. In this case, a constitutional amendment would become much more clearly needed. At that time, other variations could also be considered for the amendment. The ability for the court to be partisan offers short-term gain, but long term divisiveness for the country. I am not sure that creating some kind of super majority is going to help much, especially with such a small population. Tyranny of the minority or majority are really just two sides of the same coin. It is tyranny to those in the other group. Dred Scott and Plessy v. Ferguson were 7-2 and 7-1 decisions. Does that make them good (unbias?) decisions? We have to accept that we are going to get things wrong from time to time. Fortunately legal opinions are just that, an opinion, a product of its time, and owner. They can be changed either through subsequent decisions or legislation (many forget that the latter is always an option). A term limit is certainly an option to allow for opinions that change with the times. Personally this does give me pause. Do we really want the SCOTUS to be an election year issue? I suppose it already is, you just have to be willing to accept that there will be periods where your side is not in the majority. I would be one that would support a limit, but I also feel that the legislature needs to be fixed. Eliminating gerrymandered districts would go a long way to getting more moderates into office. People who might (GASP!) compromise on things, and perhaps not railroad sloppily written legislation through while they have a slim majority. Sadly, it's a huge election year issue. In fact, when I have asked people why they are voting one way or another for President, supreme court pick is usually very high on the list, even at the top. Not as was intended. Thus my desire to discover rules that might make that less a factor. And while yes, if a court is totally packed with one philosophy, that will dominate, no matter what rules one comes up with, other than requiring 9-0. If I understand the problem correctly, there are 9 justices who can decide a case in one of two ways (assuming they do not recuse themselves from the case for what ever reason). That give us 2^9 combinations, or 512. Of those, 126 are 5-4 decisions (5! (9 – 5)!). [Please correct me if I used the wrong equations.] The court hears 130 cases in a typical year, a system like this would really tie their hands. Consider the case of a person on death row seeking a new trial. Five justices agree that he should get a new trial, but what happens if those five agreed the same way on a different case last week? Would they have to negotiate on which case wins? I offer uniqueness as a simple to understand example of a rule, but as I say, the real rule would not be this simple. You would indeed tune the rule so that it allows the court the best flexibility for what it really needs to do, while discouraging too much pooling. In the case of 9-0 it's easy for the court to find an alternate vote which passes such a decision. There are immediately 9 variations where a judge abstains, and 72 more where 2 judges abstain. However, you might want to design the rule to avoid such tricks and match the real pattern. While I did not propose it, the judges could also play a role. For example, you could let judges declare that they think there is a "wing" of the court and name the justices. Then the system might discourage those justices from banding together in their votes. This works because if there is not actually a wing, then this is no impediment. If a Supreme Court judge can't be political, how are they supposed to decide a case? It's not like SCOTUS decides issues of fact. They mainly interpret the Constitution, and if 5, or 6, or 7, or 8, or 9 of them all interpret it one way in one case, they're likely to interpret it the same way in another case. The need for tricks wouldn't just come up in 9-0 decisions, but in every decision. If 4 justices are consistently wrong about an issue, why shouldn't the other 5 be able to outvote them every time that issue arises? There is a difference between being political, or having a theory of constitutional interpretation which you stick to, and being partisan. Which one is it if you believe that the Constitution protects (or doesn't protect) the right to an abortion? Either way, I think that's a position that Supreme Court justices should have (even if they have to pretend they don't during the confirmation hearing), but one which would be hindered by a rule like you propose, which is essentially a rule against ruling consistently on an issue. Which one is it if a Justice believes in a living Constitution? Which one is it if the Justice is an adherent of originalism? Which one is it if the Justice believes that stare decisis should rarely be a factor in a decision? Supreme Court rulings are rarely partisan, in my opinion. But they're almost always political. As the highest court, they have no choice but to be political, unless they want to be a branch of government that is subordinate to another branch. Clearly that isn't partisan, right? But it'd be thrown out along with the bathwater if there was too much consistency. Correct -- but the correlation of 2 judges would be unlikely to trigger the sort of test I am thinking of, or more to the point, the test could be designed to not be triggered by that. In particular, its strongest effect would be on correlations among 5 judges, which is the one thing we don't want, a group taking control of the court by numbers, for any reason at all -- either party politics or other politics. Better for 5 to be in control than 4.